It’s common knowledge that the 1930s were a tough time in America. The Great Depression caused families to make difficult choices in the face of high unemployment and the loss of a steady income and savings. 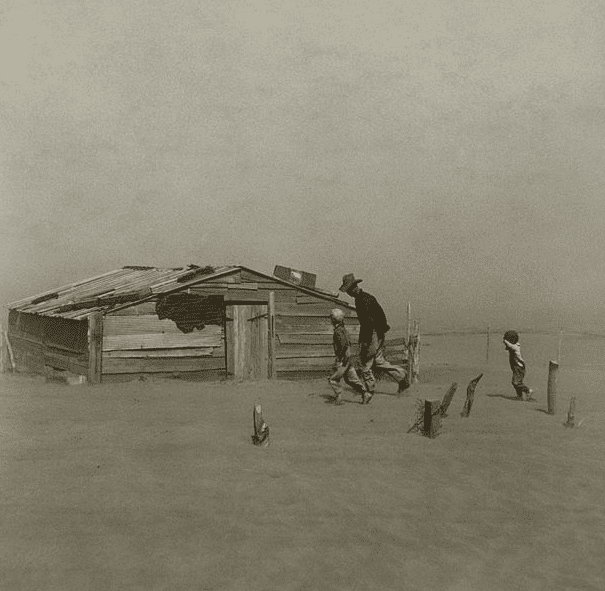 The 1930s also brought severe drought and dust storms leading to the Dust Bowl – which further uprooted families, wreaked havoc on farms, and led to displaced families migrating in the hopes of finding work. Photo: a farmer and his sons walking in the face of a dust storm, Cimarron County, Oklahoma, April 1936. Credit: Arthur Rothstein, for the Farm Security Administration; Library of Congress, Prints and Photographs Division. As if that wasn’t enough, a very cold winter led to a record-breaking hot summer in 1936. So hot in fact that it set a record not broken until 2012. 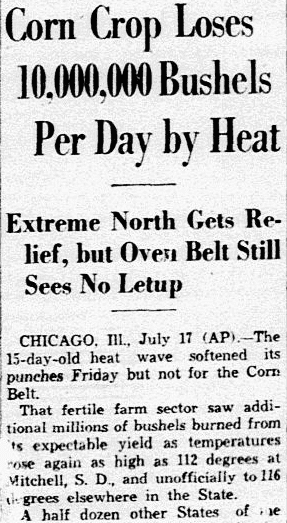 Aside from being unbearably hot, the 1936 heat wave led to additional problems including people dying and the loss of crops. How hot was it? Starting in June 1936, it was not uncommon for temperatures to hit well over 100 degrees throughout the nation. Now that might not seem like a big deal for those of us who live in regions where the summer months routinely mean temperatures over 100 degrees, but for most of us today those days are spent in air-conditioned surroundings. With little relief from the heat, 100-degree days and even nights can mean disaster for people who can find no escape. One of the hardest-hit places during a heat wave is the nation’s farms. The heat wave of 1936 brought devastating losses that affected various aspects of the farmer’s life and livelihood. The heat affected the farmer’s “working” animals, like horses used to plow fields and chickens whose egg production was relied on by farm families. Crops were affected as well and the dry, hot conditions were perfect for bug infestations. What the heat didn’t take the grasshoppers did. 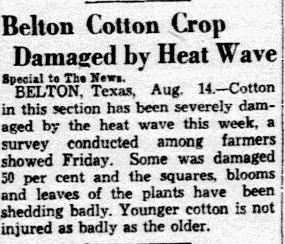 Newspaper articles across the country reported the damage to crops like cotton and corn. Rain was months away in the summer of 1936 and to farm families struggling to eke out an existence, the overly hot summer months that year must have felt like the final straw. 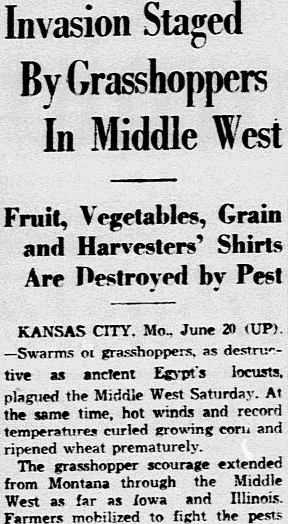 According to this newspaper article, the heat wave brought with it “the greatest infestation of hoppers in decades” in the states of Missouri, Oklahoma, and Kansas. Billions of them destroyed growing fruit, vegetables and grain with amazing speed. They riddled the shorts of harvesters, gnawed shallow holes in the handles of pitchforks, and left nothing but the pits of cherries and the stones of peaches hanging on fruit trees. Everyone is affected in some way by a widespread heat wave. Though residential air conditioning was available in 1936, like all new technology it wasn’t commonplace until later – in this case, after World War II. So how did families avoid the heat that pushed well over triple digits? As you might have guessed, everyone had an opinion about staying cool. Of course increased intake of water or fluid will cause increased sweating. Now don’t argue with me about this. I’m teaching you physiology. Sweating is the only way you can keep fairly cool when the atmospheric temperature approaches that of the blood and the humidity is high. Advice for staying cool even extended to the youngest members of the family. 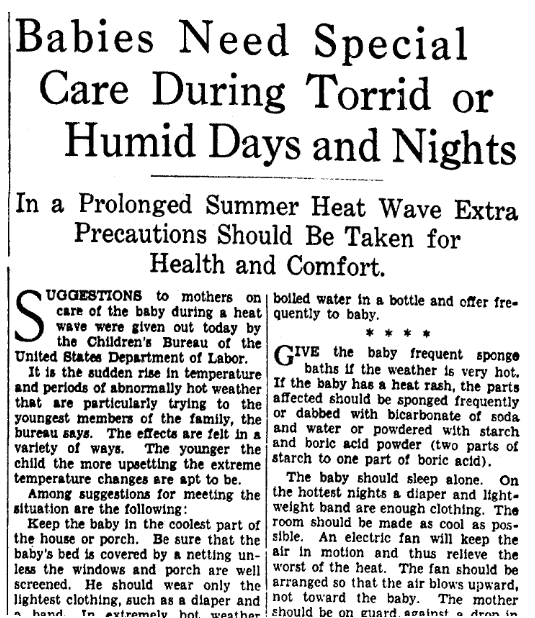 This advice found in a Washington D.C. newspaper article addresses baby care during a heat wave, from the Children’s Bureau of the United States Department of Labor. Recommendations include sponge baths with cool water, keeping their bottles cool, and wearing light clothing or no clothing at all. What other ways did families use in 1936 trying to stay cool? 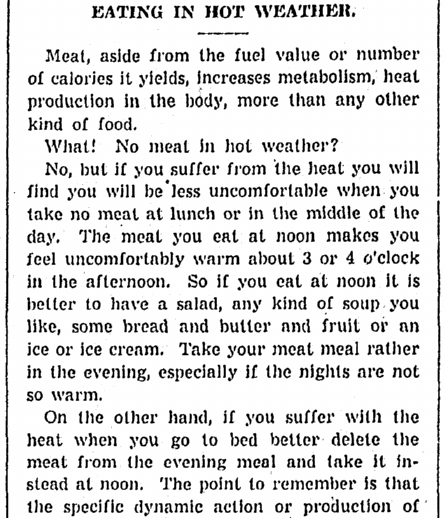 Much of the same things we do today, including: limiting activity, drinking cool beverages, swimming, and sitting under a fan. A favorite cool escape in 1936 that is still enjoyed today is going to an air-conditioned theater to see a movie. In the summer of 1936, families could escape the heat, if only for a few hours, to see the latest Shirley Temple movie Poor Little Rich Girl. The Census Bureau estimate was made on the basis of mortality reports from eighty-six centers of population. It found that 12,183 persons died in these cities between July 11 and 18, compared with 7,439 in the corresponding normal week last year… Sixty-five per cent of the deaths in the Nation during the last seven days, on the basis of statistical probabilities, could be assigned to the heat… Behind these cold statistics were many tragedies – of old men with weak hearts collapsing on a walk to town, of children sweltering in tenements, of laborers dying at work. Hardest hit financially due to the heat wave were the farmers who relied on cash from crops that never came to fruition. One sign of relief was the year-old New Deal program, the Works Progress Administration. The WPA helped farmers, and others needing jobs, work to provide for their families. It’s definitely hot where I live but I am very grateful for an air-conditioned house that can make the heat tolerable. What’s the weather like where you live? Note: An online collection of newspapers, such as GenealogyBank’s Historical Newspaper Archives, is not only a great way to learn about the lives of your ancestors – the old newspaper articles also help you understand American history and the times your ancestors lived in, and the news they talked about and read in their local papers. 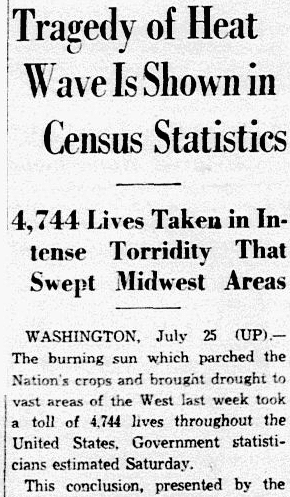 Do you have any family stories of the 1936 heat wave? Please share your stories with us in the comments section. July Update: GenealogyBank Just Added 9 Million More Records!